We're not down to the surprise yet, but we're getting close. After all that Mission history, my brain needed a rest, so when Miss Pat (not to be confused with Miss Patty of the Chance household) asked if I was interested in an art show, I said SURE. Really I had no idea what to expect, but if Pat says it's cool, then I'll go. She had met an 89 year old painter who invited her to a show in Northern Tucson. It seemed to me it was about 100 miles away, as we drove and drove until we found this crazy art gallery halfway up the mountain. 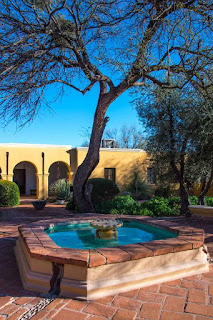 Ettore DeGrazia built several buildings to house his art. The entrance doors are from an old mine ... in fact, it looks like you are entering a mine when you go in. I have to be honest, I'm not much into ART. Really, we were looking for the nice lady Pat had met, but paid the entrance fee and took a look around. This place was fascinating!! He not only painted, but did several other types of things like clay art, some beading and some really weird stuff that I don't know how to explain. We contemplated a hanging thing that had horse teeth and critter backbone parts and pieces. It was different to say the least. This painted horse head looked like he had doodled on it one day just for fun. He was very much into the Native Indians and early Christianity. You've probably seen the little children images before. You have to look close at this one to see a thundering herd of black and white cattle. Different, right? So we made a right turn and luckily ended up back in the gift shop where we asked for directions to the little Art Show being held by local artists. Outside, down a pathway surrounded by tin can flowers, we ended up at a tiny building where they were still getting set up. Pat has oil painting experience. I have nothing and am not the least bit talented. Still, when I saw these images, it made me want to try. In the meantime, Pat reads my blog and knew I had a problem with the poker table cover. She knew exactly where to go to find a glass top on the cheap, so off we went to the OTHER side of town to Big Lots. Now who in the world would think of Big Lots as a repository of table tops. Certainly not me. As we wandered around, they said the glass tops were gone, just as I spotted a glass-top outdoor patio table. Ding ding ding!!! The light went on. It said 48" around and I needed 47. No amount of measuring would assure me it would fit, but I was willing to give it a shot. Unfortunately, it did NOT fit in Pat's SUV. Instead, she took me home and I went back in my Jeep that had an opening on the angle of 49 inches. It took the salesman and I ten minutes to get it IN the car and me another twenty minutes to get it OUT. That thing was heavy and awkward. BUT LOOK ... IT FITS PERFECTLY!! Not only perfectly, but if it were 1/8" less, it wouldn't work at all. The metal rim fits the table exactly and the bumpers underneath keep it off the top of the table. Problem solved!! Meet my new dining room table. I was so excited!! By the way it was only $69. Thank you Pat for making my day!! Not only did I get a couple of nice pieces to frame, but I got my table top!! And there's STILL more to come, but it will have to wait until tomorrow. 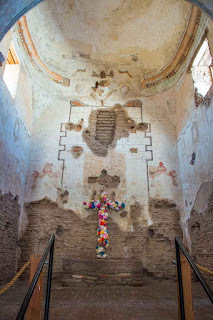 The last of the three missions I toured was Tumacacori. It was started in 1691 by the Jesuits. At that time, Spain thought they had amassed a fortune and weren't passing it along, so they were deemed bad guys and mostly all killed. The church was abandoned for a year or two until the locals, along with the Franciscans, began construction of Mission San Jose de Tumacacori. This is where everyone ran to when the Apache raids were happening every day. It is very similar, maybe a little larger, than the other missions we saw. Just like the others, the sanctuary is very narrow and long, with wooden beam ceilings. Although in disrepair, at least most of this one is still standing. 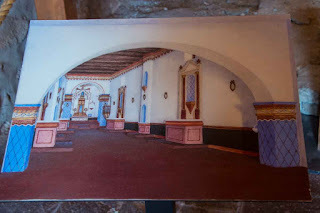 Here is a picture of what it probably looked like in the days when it was finished. 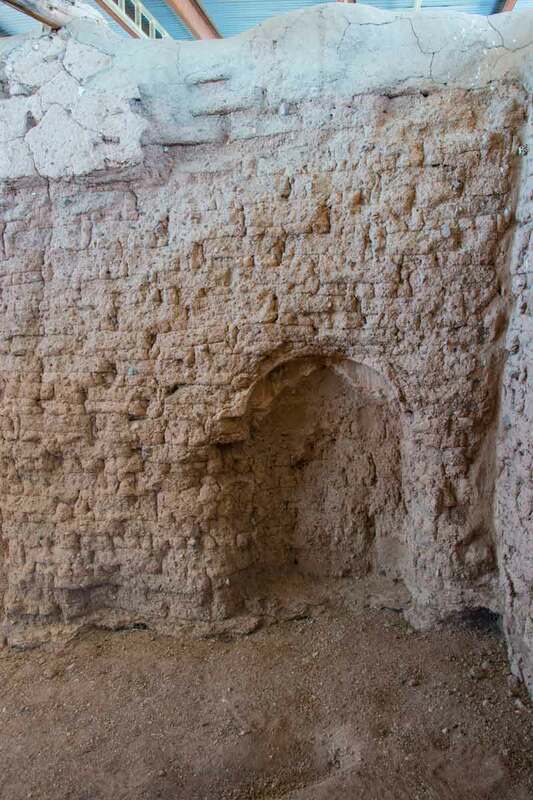 This archway collapsed some time ago and is much narrower than the picture looks. Even in it's current state of decay, it's a very reverent place to stand. You can feel the history here. You can see remnants of the beautiful paintings around the ceiling, but over time water has done it's work of erasing most of it. It's very sad to see this beautiful building falling apart. 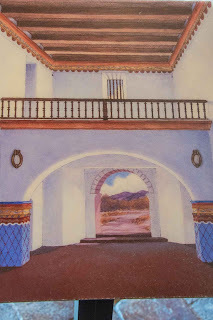 Looking back at the large entrance doors, you can imagine what it once looked like. Although there was no tour guide through this mission (you walk around the compound on your own) I'm guessing the wooden beam roof rotted away, letting the water take it's toll. They have at least replaced the roof to try and keep the remaining walls stable. These pictures around the building give you an idea of what it might have looked like when it was new. As you can see above, the balcony is no more. Just inside the front door was this archway and a staircase heading up to the second floor where baptisms were held. Unfortunately, they have a padlock on the gate just out of sight. Out the back hallway is the sacristy where the Priests changed their robes. 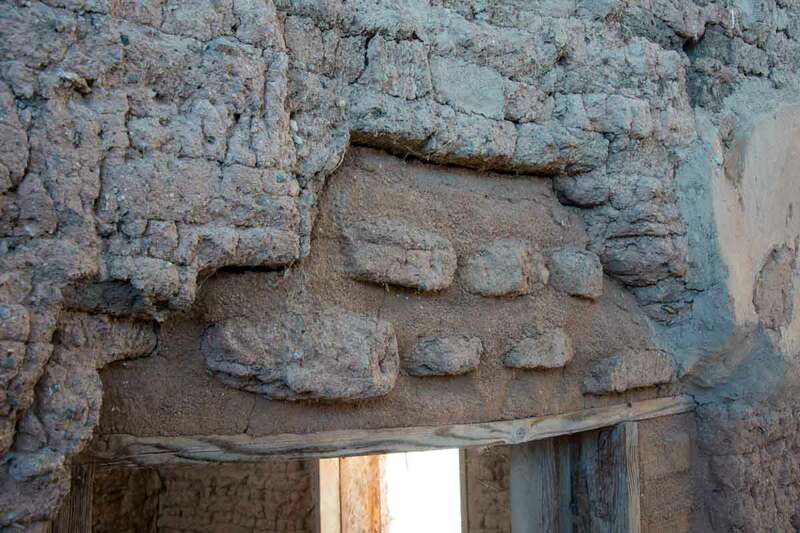 This part seems to be in better repair due to an adobe ceiling instead of wood. Once outside, the first thing you see is this beautiful round building in even better condition. This was where the locals would mourn their dead before being buried in the cemetery at the end of the courtyard. The holes in the wall are from the scaffolding they used to complete the top row of beautiful brick. The domed ceiling was never completed. 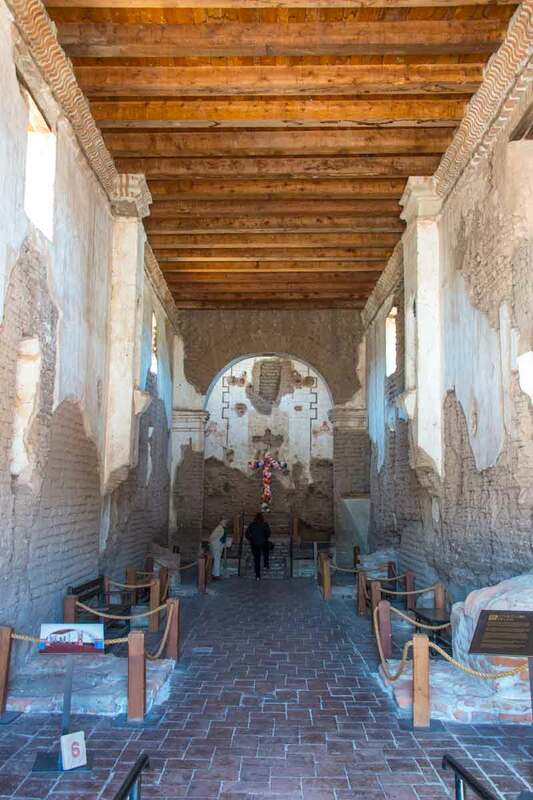 In 1848 it was abandoned as everyone moved to Mission San Xavier Del Bac to escape the marauding Apache. 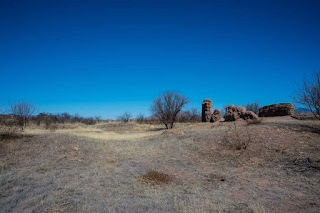 Although used as a cattle ranch, the courtyard becoming a corral, eventually people returned and began to use the area for it's intended purpose, a cemetery. 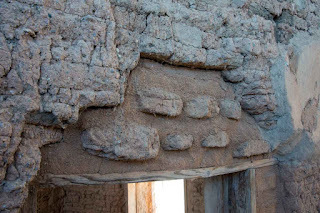 In the surrounding wall are 14 niches representing the 14 apostles. It is sad to note that the recent rains we had made their way into the building and a large chunk came loose, causing even more damage. Just seems to me that if they asked the community of Tucson, they would get more than enough volunteers to do whatever is necessary to keep this building safe. Maybe I'm just an optimist. As you can tell, the bell tower is made from all brick instead of adobe. What remains is still beautiful and well worth the trip to see it. 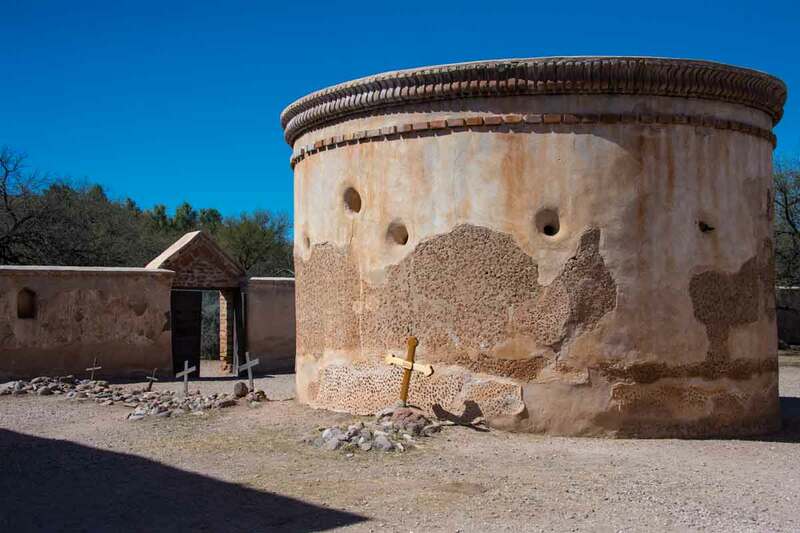 Tumcacori is just three miles south of Tubac, which is another GREAT place to spend the day perusing the many shops full of cool STUFF!! 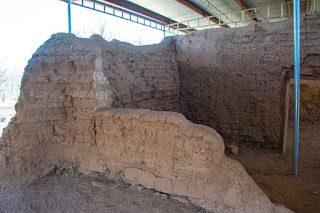 Also on the grounds was a large adobe storage building that was eventually turned into living quarters and there is another building which represents where the natives lived. 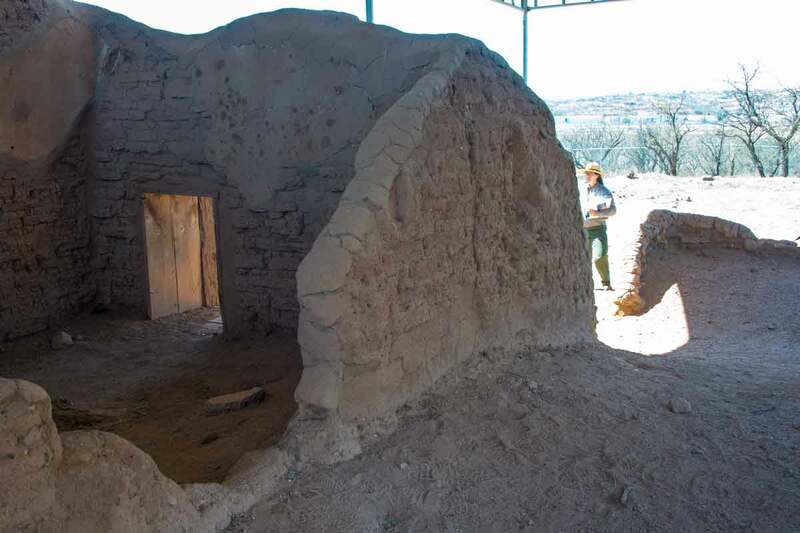 It's a small adobe building with cactus branch roof and a shade cover outside. The next Mission would be Xavier del Bac. They were built about a day's walk or ride apart, meaning about 20 miles or so. I've shown pictures of it before, but it's so spectacular, I think I'll go again. 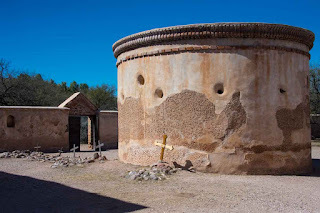 I wish I had more time to take pictures at Tumacacori, but I was already an hour late for an appointment in North Tucson. It seemed like it was in Casa Grande, I had to drive so far. It's my latest project I've been waiting to tell you about. This is Calabazas (sound like a squash?) that is probably named after the wild coyote gourds that used to grow in the area. After a Pima Indian uprising against the Spanish in a neighboring valley in 1751 causing the villagers to scatter to the mountains, one Priest decided to create this mission up on a rocky dry ridge, the better to see you coming. 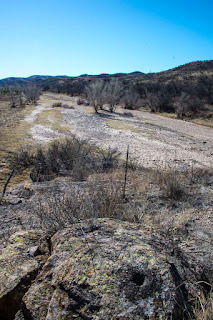 Unfortunately, that meant they had to carry all their water and walk a long way to their fields below near the riverbed. When workers were gone to the fields, the Apache took quick advantage, raiding their food supplies. Pretty soon, the poor villagers were carrying all their worldly goods to the fields with them, like their furniture and even their chickens. 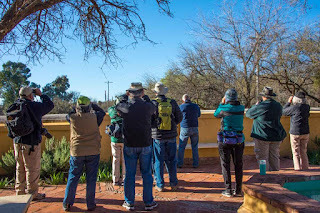 They figured out pretty quickly that this was NOT the place to be and moved closer to the Tumacacori Mission for protection. After another long drive to a roadside pullout, we walked about a quarter mile before turning up a steep hill and heading down another road for not quite half a mile. Here's what we found, surrounded by chain link fence and razor wire. Thankfully, they are trying to save the remains of this mission. Again, there was a tall adobe fence around the entire grounds with only one entrance, the depression you see here. Situated sideways to the entry gate, this was the entrance to the church itself. 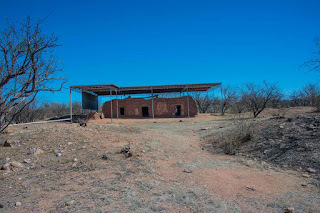 Once mostly abandoned due to Apache raids, the Governor of Las Cruses illegally purchased the property (basically stealing it from the Indians) and turned it over to a German group who ran a cattle ranch. 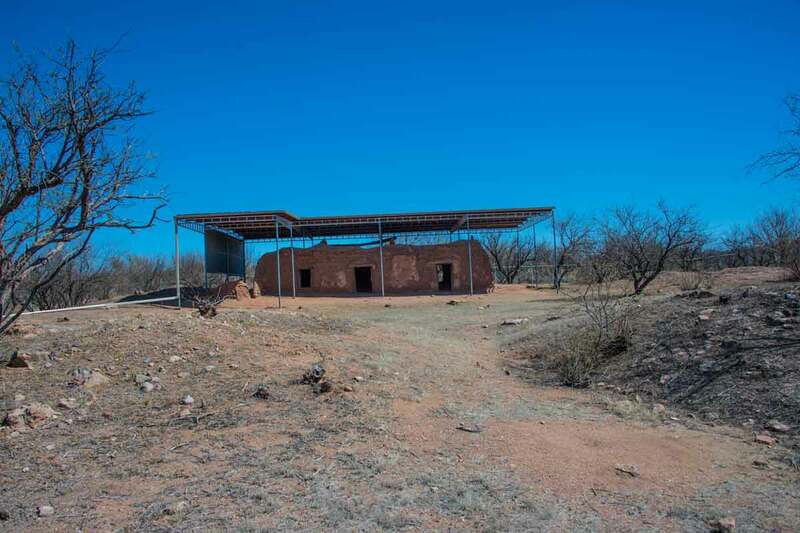 They immediately plugged the entrance door and added several interior walls to make it a bunkhouse for the ranch. Sorry for the pole .... they are in several images holding up the cover structure. You can easily see the plugged entrance here. This is a rather short doorway, you have to bend over to get through. 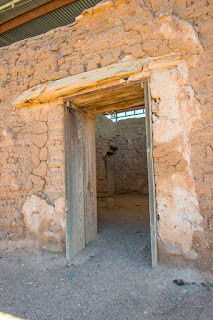 The melting of the adobe has added about three feet to the floor. The overhead timbers still show the axe marks from when they were cut and laid over the doorway. 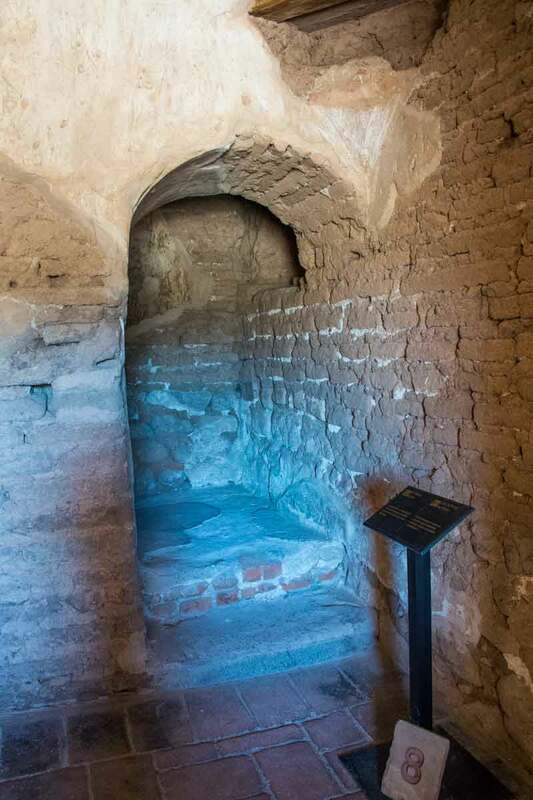 Immediately to the right inside the main doorway was a fount that held Holy water. Dig out three feet of dirt and you would see the entire thing, along with the whitewash that once covered the entire building. 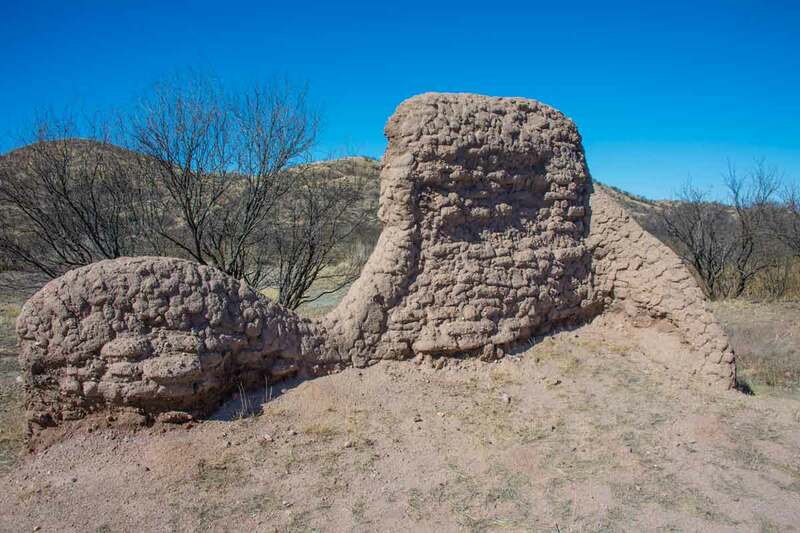 The ranchers used rocks in several places instead of adobe bricks. Imagine this plug gone. The outside wall has disappeared completely. I'm standing looking to the left where the Priest would stand as he preached to his people kneeling in the sanctuary. The half wall is another plug the ranchers put in. 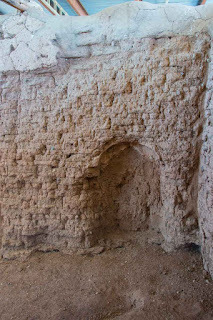 Here you can still see some of the original whitewash on the wall. Looking to the right of the sanctuary (again with a half wall) would be where the Priests stored their accouterments for the services, things like silver candleholders, etc. If you want to see an example of what it might have looked like, the next Mission will give you a much better idea. Once again the political climate changed until Calabazas was included in the Gadsden Purchase and became part of the United States Territory. In 1756 the U. S. Military set up Camp Moore and the Treasury Department immediately set up a port of entry here (no surprise ... taxes), using the church as the first Customs House. Another rock structure was built on the property (one the Ranger seemed to ignore completely) and was used as a post office of sorts by the military. The only thing that didn't change were the Apache attacks, right up until Geronimo was sent into exile in 1886. By then, the railroad had arrived down in the valley and the little church on the hill was abandoned. 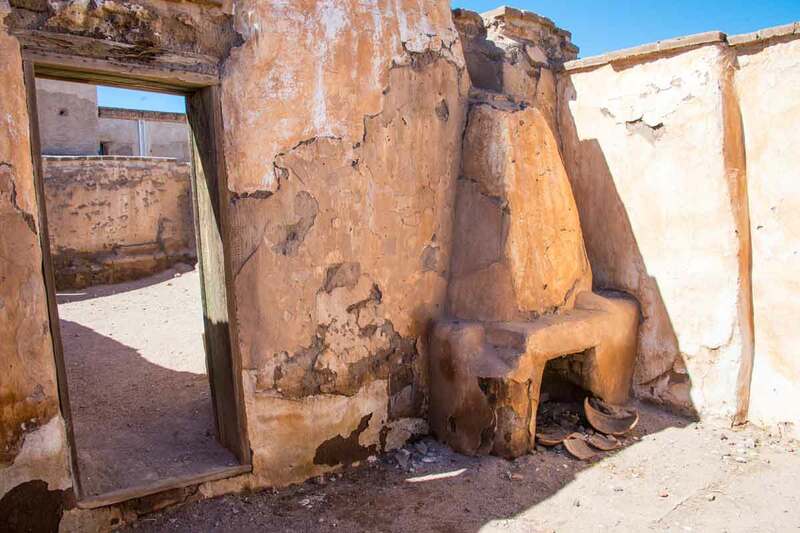 Next up ... the third Mission ... another amazing example of not doing much at all to save an amazing piece of history!! The good news is I won't subject you to all 45 pictures at one time. This is a great tour to take if you're interested in the local Indian history. If you want to see amazing structures, skip this one. 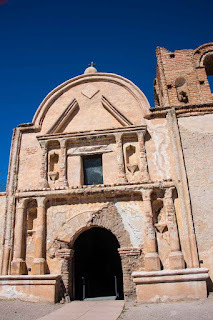 After an hour's drive, I arrived at Tumacacori (pronounced Tuma-caw'-cor-ee). The first tour going out was a bird watching group. As you can see, someone spotted something beyond the fence. They were looking the wrong direction because right next to them in the tree was this little beauty. 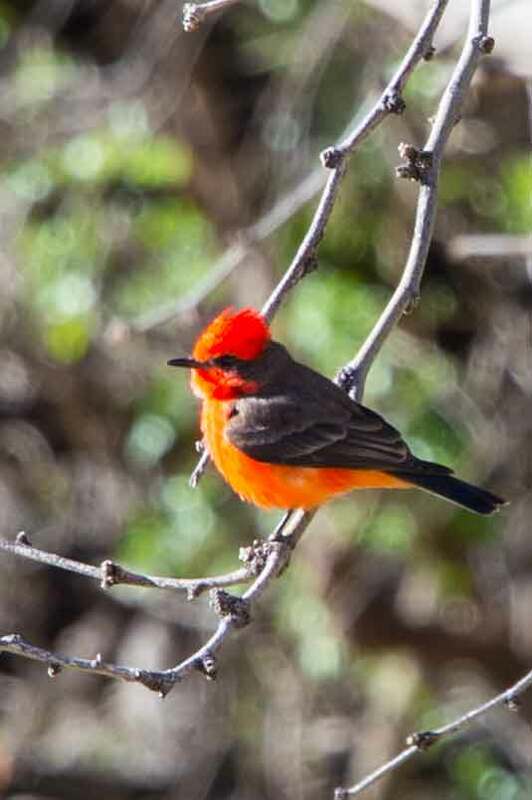 A tanager of some sort I imagine, but the book that would tell me was sacrificed in the interest of space in my RV. 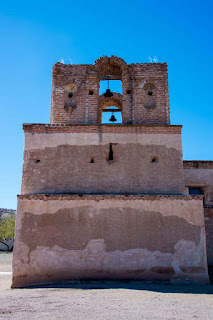 There is a Mission at Tumacacori just beyond the far walls, but I hoped to have time to see it upon my return. 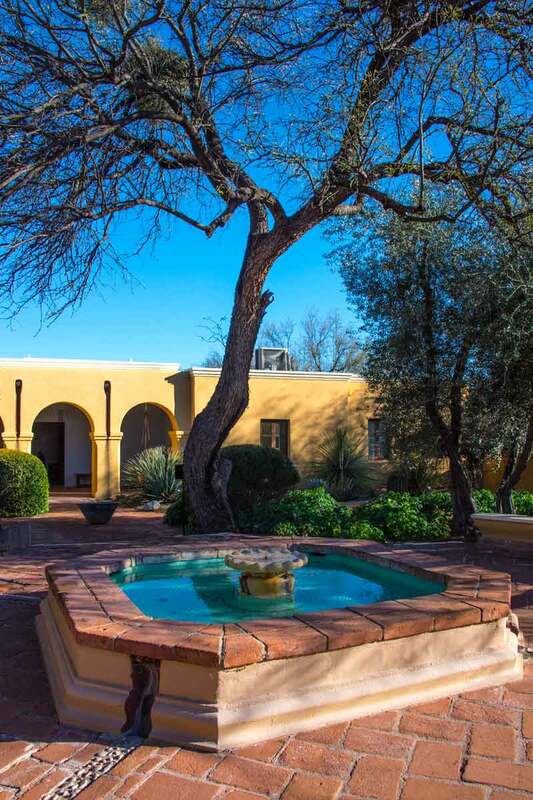 There's a beautiful fountain in the yard, just waiting for you. Our guide remained nameless as nine of us jumped in the van for the long ride South to the border. Finally off on a private dirt road and through a couple of locked gates, we arrived at a wide spot with no sight of a mission. It was downright cold as the wind blew right through us. We walked down a road, then off on a trail, when we came to this raised hill. Looks like a mission, right? Actually, three years ago an archaeology team came here and dug up this mound to discover a very old adobe building, now totally dissolved back into the earth. Instead of leaving it open, they covered it back up. So here's the history part. 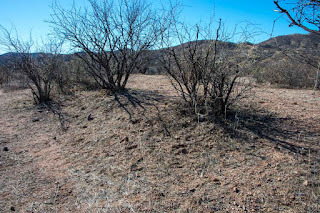 Way back when, Arizona wasn't really a desert, but a huge grassland without all the scrub brush. It was the Spanish who came here to conquer the area for resources and gold for Spain. It started with the Missionaries coming North and establishing missions to assimilate the local people. They had an ulterior motive however, can you guess? The Spanish brought cattle for food, which like lawnmowers, mowed the grass to the ground. 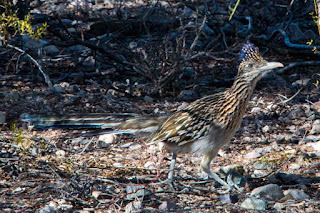 With only scrub brush left, they ate that, dropping piles of seeds along the way. In no time, the entire area was full of new growth scrub brush, or what you see today. Least that's what she said. Hard to imagine, but being familiar with cattle, I can see that happening. 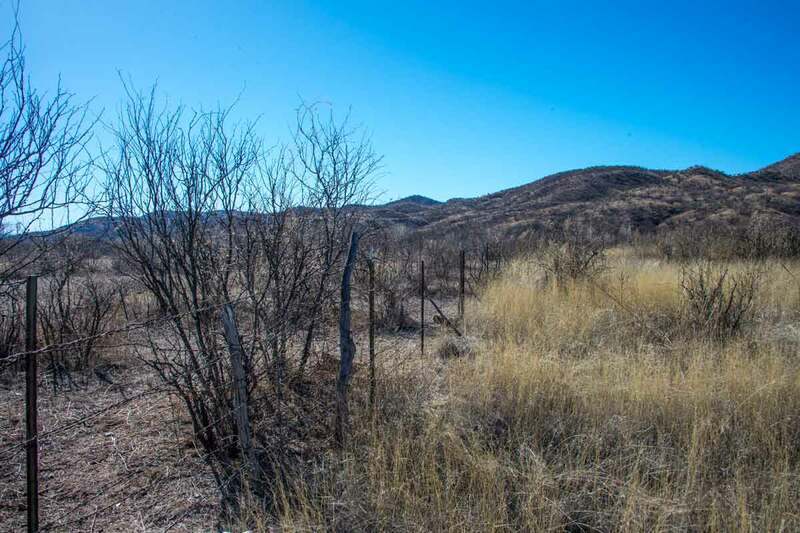 Here's a good example though ... the area on the left of the fence has a few cattle on it and NO grass. Look at the grass on the right!! It was knee high. 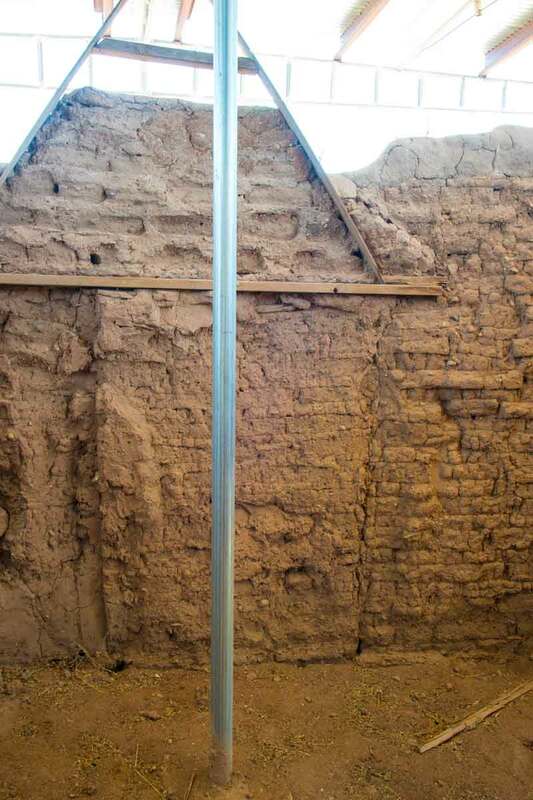 So the missionaries decided to build their mission right where the Indians were living, since they had already discovered the most important thing ... water. 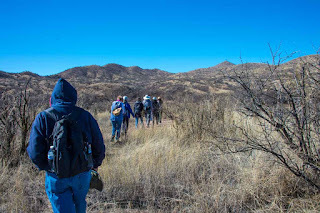 Here we are walking to the edge of the riverbed. Although dry now, the Santa Cruz river runs wild during heavy rainstorms, and probably had a lot more water before all the dams were built in Arizona. In the very bottom right hand corner of this image is a hole ground into the rock. We were told this was a grinding stone rock, although I'm not so sure. I'm seen hundreds of these with usually many in the same spot. There were no other holes here. At any rate, we finally came upon the remaining adobe walls of Guevavi (pronounced Gwa-va'-vi) Mission. Guevavi means Big Spring. Although about 20 miles apart, these missions were either the MAIN encampment with a Priest, or they were set up as an outlying place to stop along the trail. This one had no priest for 30 years, and so fell quickly into disrepair. Here's what it looked like originally. 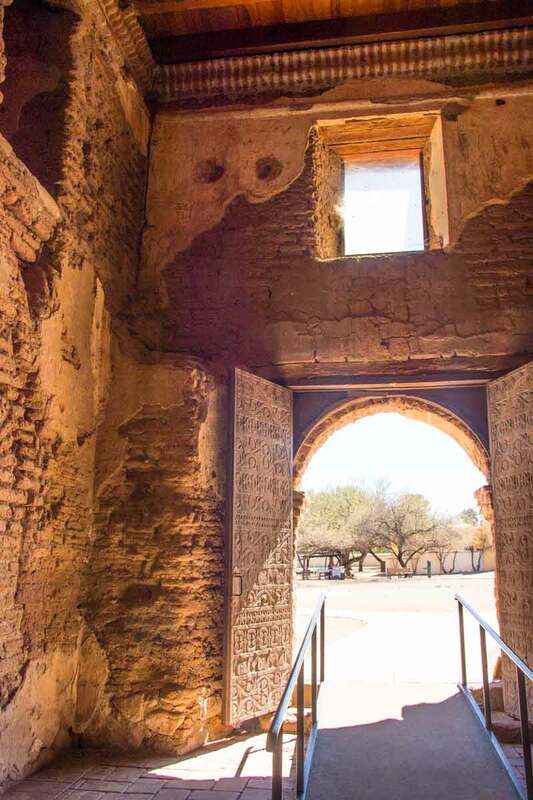 Hard to see unless you are there, the outside walls have all dissolved into little hills with the depression in the middle being the entrance door to the courtyard. All the little rooms around the outside were used to teach the Indians how to grow things, how to tend to cattle and how to pay taxes, the ulterior motive. Didn't take Spain long to impose taxes, right?? The three wide walls on the map are all that is left of the sanctuary. It's very small, maybe only ten feet wide and twenty feet long. 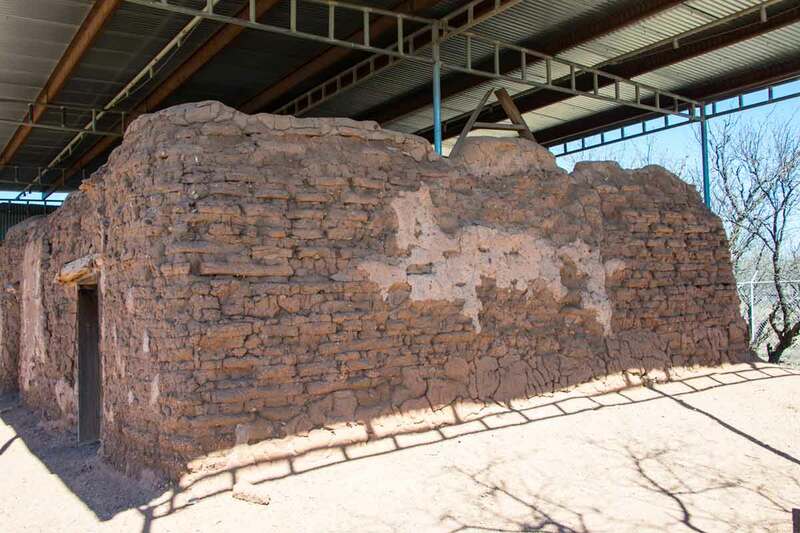 Unlike other adobe walls, these are made with a lot of rock in the mix. 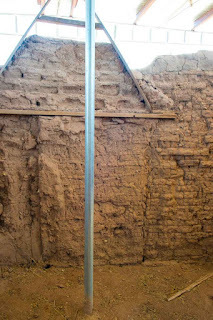 There's an adobe brick, then two inches of mud, then another brick, making it easily fall apart when it rains. 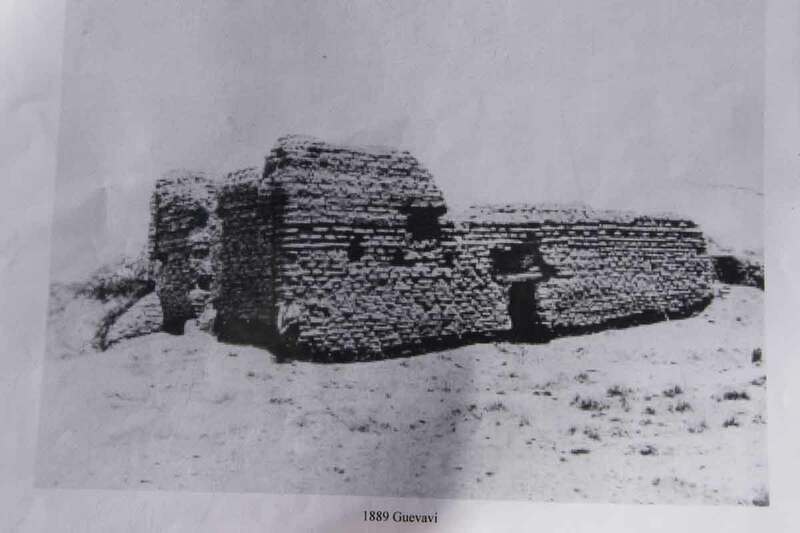 This picture was taken in 1889, compared to what remains today. Pretty sad. Although we were warned about snakes, it was WAY too cold for them to be out. The cattle, curious beings that they are, followed us everywhere we went. 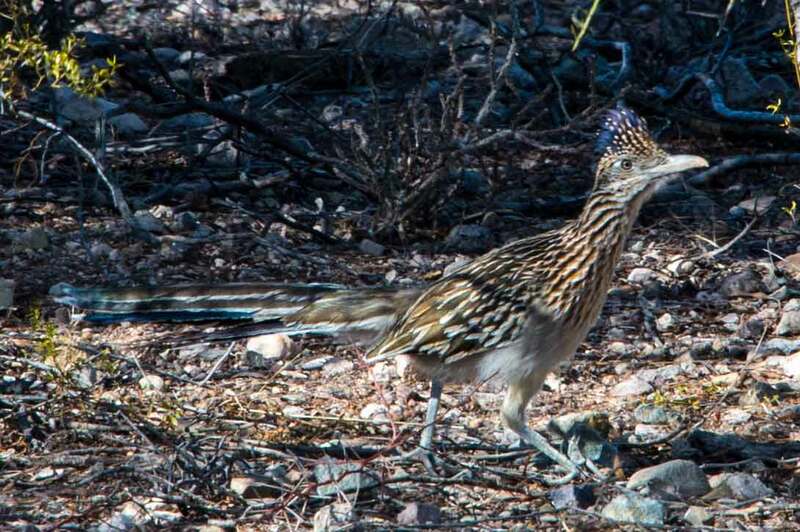 I can't say as much for this roadrunner. LOVE these guys!! So that's it ...first mission down. Not quite what I expected, especially when I heard the Park Service isn't doing anything to stop the erosion and the University is not doing any excavations. There's got to be so much history there!! 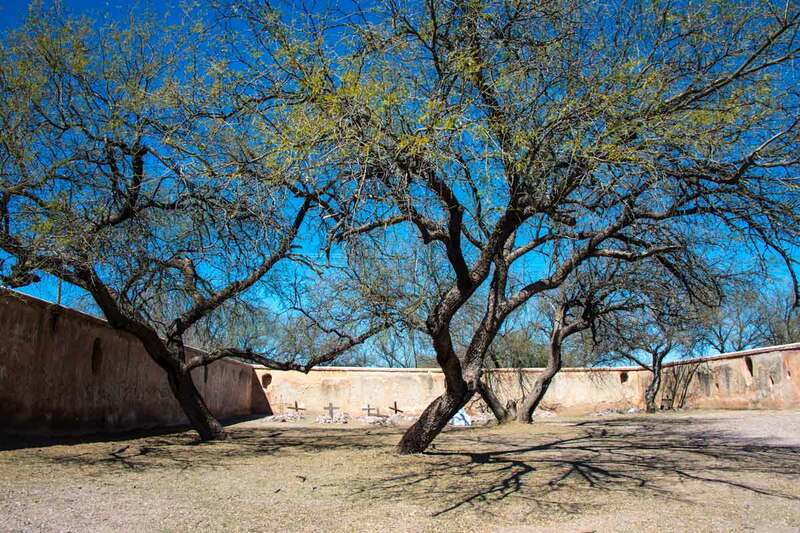 So in the end, the O'odham people were never able to go back to their normal lives. 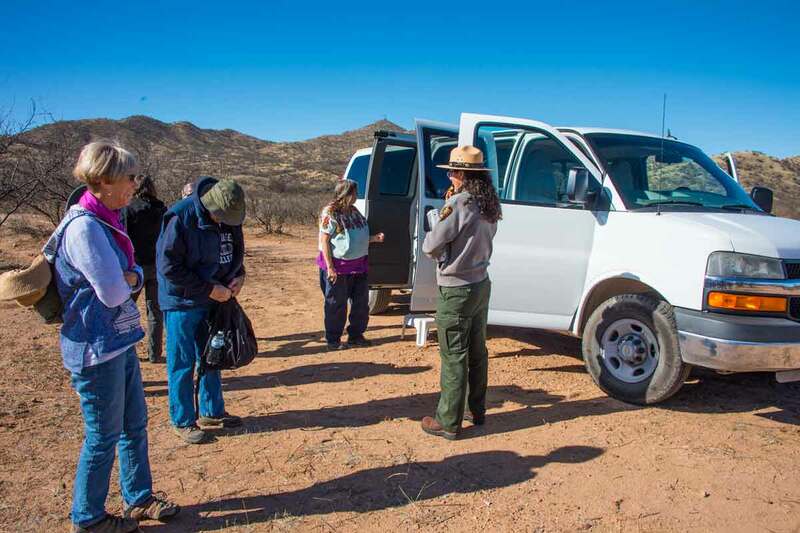 They raised cattle and grew food, only to have most of it stolen by the Apache. Spain, in their infinite wisdom, gave the Apache lots of food and cattle to keep them quiet. When the treaty was formed and some of the land went to the U.S., they quit giving out the goodies and the Apache revolted. Sound familiar? The Apache then began to raid everyone around them because they didn't know how to grow crops and raise cattle themselves. Easier to just steal it. Eventually the O'odham people gave up Guevavi and moved to Tumacacori Mission for protection, abandoning the first mission. Lots of history, not much to see. Still, worth the $25 price which includes all three missions. Tomorrow .... Mission #2. Seems nowadays things aren't meant to last. I have to admit riding in an RV is like an earthquake going down the road, which probably didn't help any. Just when I needed it, which hasn't really been all that often, my rig printer died. Isn't that always the case? These HP printers are not expensive, except it took four hours of driving around Tucson to find one. They actually run around $100. It's the ink that makes them the big bucks. $36 for two tiny cartridges that will last about three weeks. At least I'm back in business. It helped (however slightly) that at the local poker game last week, I actually won $3.00 and I didn't lose my $5 buy-in ... that makes an $8 win in my book!! I'm rich!! Maybe that will help pay for the cover I need for this beautiful oak poker table the previous owners left here. I checked on glass ... $150. I called Tucson Table Pads which resides in Indianapolis Indiana (????) who gave me a price of $150 also. Whoa Nelly ... that's too high. So Elaine (we are on a first name basis now) said she had a promotion she could offer for a total of $129. Gee Elaine, how come you didn't offer that first? I declined. There just has to be something to cover the top so I can use it for a dining room table. Just turn the top over you say? Good idea, but it then becomes a snooker table, still not good for dining. Neighbor Pat was instantly sold on this baby who's so fast I couldn't even get a good picture. This tiny little ball of fluff LOVES people. We had a nice visit while I sat on the floor and got lots of puppy love. He's a cross between a Yorkie and something cute as a button. His name is J J.
Patty knows all about salesmanship. Snoopy kitty talked them into taking her home from a shelter in Idaho a few years ago. Sweetest kitty ever who is currently locked in the bedroom/bathroom jail while the floors are done. I stopped by yesterday to get my kitty fix and see about laminate for my two extra bedrooms. In between pruning the rose bushes outside and trying to get rid of really old carpet, I stitched together a few more pieces for this quilt. Isn't this just amazingly colorful? So easy to sew together! This is the birthday discount fabric Patty led me right to last week. I LOVE IT!!!! 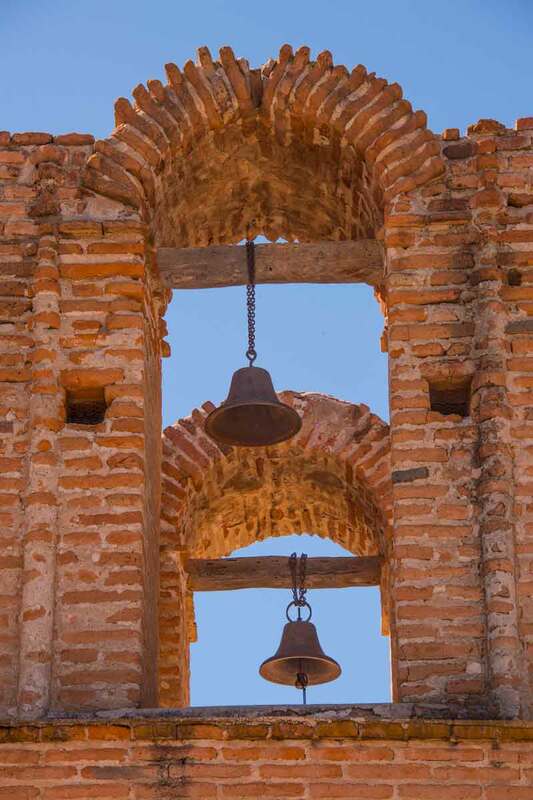 There's two big furniture auctions today, but Nancy is being a good girl and going to visit a really old Mission down south towards the Mexican border. It's going to be a hike ... they said bring food and water. Hopefully my shoulder will outlast the heavy camera. Pictures tomorrow. They say if you don't like the weather, just stick around and it will change. The views in my back yard fall into the same category. 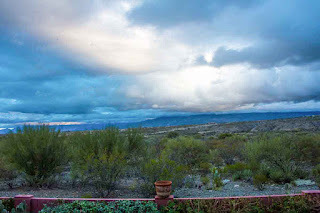 It's amazing how a few clouds can make for dramatic scenery changes in this and the picture below. I stayed up WAY too late last night just to watch the Russian Women in the Figure Skating Competition. They are the best in the world, with the highest scores in the history of skating. The really old skater at around 18 or 20 years of age, was just spectacular. The up and coming FIFTEEN year old beat her for the first gold medal for Russia. You've all heard of the drug scandals regarding Russian athletes, well they got caught big time during the last Olympics and were completely banned from this year's events in Korea. The only Russians allowed to be in the Olympics were those who without question, passed the drug tests WAY in advance. Thank you Olympic Committee for finally taking command. If you get a chance, watch both performances. You probably won't see that kind of incredible skating for many years to come. Back to the rodeo, I forgot to show you my latest acquisition. Every year they have an artist, all local people I think, paint and/or draw a picture. In the past, most have been black and white, one of which I have rolled up ready to frame. Do you know how much it costs to have a poster framed? It was enough, even at Michael's, to put it on the back burner. THIS year as we walked around, I had no intention of getting another one due to the cost. That's when I saw THIS! Wouldn't you know, they decided to have some framed in wormwood. The entire thing was cheaper than just the framing of the other poster, so it came home with me. That meant moving what little furniture I had in the living room around, so this would be the centerpiece over the couch I don't have yet. I have to say, that huge treadmill was a bear. I got it about halfway across the room before finding out just how heavy it was. I couldn't slide it sideways into the window bay. I figured those moving pad things would work, but I didn't have any. My brain actually kicked into overdrive. I got two pieces of heavy cardboard to slide underneath, but couldn't lift it high enough. Thank Nancy, think!! A shovel? No, not strong enough. Ding Ding Ding! The light bulb went on. I grabbed my trusty claw hammer from the drawer, worked the end under the bar and pulled back. It came up just enough to slide the cardboard underneath. Chaulk one up for Nancy. While all that moving was going on, I was contemplating the bedroom carpet. A quick trip to the Chance house netted a box cutter and I went to work. The main concern is a level floor. Unlevel will cost a lot more. After figuring out the prices of carpet ($4.54 a square foot installed) and laminate ($2.00 a square foot installed plus the cost of leveling) and in the end, it just might be cheaper than the carpet! Would't THAT be exciting!! If I'm lucky, the guy will stop by today for a look see. In the meantime, the Chance house looks amazing. It's not costing them as much as they thought, since the newest Contractor said it would not be a problem to put laminate over their tile once it was all leveled. That dropped a big chunk off the top of the price for them. Trying not to think any more about the house, which ends up costing me even MORE money, I went to sewing on the newest quilt. Put on your sunglasses, because here's the start of something pretty bright. With two hours cut off my sleep time last night, I'm pretty groggy this morning. I see an afternoon nap in my future ... and I NEVER nap!!! Let's see ... I need a glass cover for the poker table, a guest bed, tile steps repaired, the fireplace changed over to gas ....... the list goes on!! Bull Dogging Is For BIG Boys! TUBAC ... You HAVE To See This!! On The Fly and On The Cheap!